Laura Summers has won the Literature Ability Media International Award run by Leonard Cheshire Disability and supported by Orange for her book, Desperate Measures. The AMI Awards identify creativity that encourages a more inclusive world for disabled andmarginalised groups of people. Covering every aspect of the arts, the winners have beenchosen for producing work that positively represents, involves or assists people facing majorphysical, mental, emotional or social challenges. Laura Summers who was chosen by the judges for her creative excellence received theaward at a ceremony held at London Studios on 21 November. Laura Summers produced this critically acclaimed first novel so readers could understand andhopefully be more tolerant towards those seemingly “different” from themselves. Regarded bymany as "affecting, honest, and totally gripping" this tale of a pair of twins – one of whom wasbrain-damaged at birth – which follows their lives after they are told their foster parents can'tcope and the family will have to be split up, is both moving and totally life-affirming. This award, designed to identify outstanding achievement is one of 25 categories who rewardexcellence across the creative industries. The Ability Media Centre, run by Leonard CheshireDisability is a state of the art facility in London providing courses in production and postproduction, animation, graphic design, music technology and interactive media. Last week saw news break of widespread proposed cuts to the nation’s library services – from Buckinghamshire’s reported plans to close Great Missenden library, beloved by Roald Dahl and credited as providing inspiration for Matilda, through to the privatisation of Wakefield’s entire library service. There is so much news on this subject it would be difficult to list, so click here to visit Alan Gibbons’ Blog, and scroll down to Nov. 13th for his Campaign for the Book newsletter, which lists some examples. The winner of this category will be announced on 5 January 11 and the overall category winner (chosen from fiction, biography, first novel, poetry and childrens) will be announced on 25 Jan. The Children’s Book Show 2010 (http://www.childrensbookshow/) came to a triumphant end last night (17 November) with a sell out event at L'Institut Français, London. The popular event was also part of the Youth Festival. 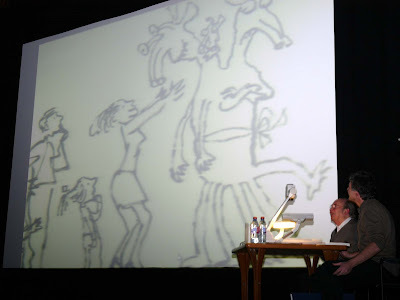 Quentin Blake, the inaugural Children’s Laureate who has also been referred to as a ‘national institution’ and one of France’s most highly acclaimed illustrators illustrator Francois Place (best known in the UK for his illustrations for Michael Morpurgo’s War Horse) talked about their work, showing exquisite examples, and then treated an enthusiastic audience to an amazing drawing duel. The artists took it in turns to transform each other’s drawings, keeping the audience guessing what would happen next. Much laughter later a splendid wordless story had been created on one sheet of paper. At the end of the show there was a round of applause when one young person asked the artists to do another drawing. The artists took up the challenge and picked up their pins, giving the audience another chance to see two masters of their craft at work. Louise Yates is the winner of the Funniest Book for Children Aged Six and Under with Dog Loves Books (Jonathan Cape). Louise Rennison is the winner of the Funniest Book for Children Aged Seven to Fourteen with Withering Tights (HarperCollins Children’s Books). Legend Press are delighted to announce a unique workshop event, including the opportunity to meet some of publishing's top commissioning editors, agents and marketers, and will include discussion of writing and editing, how to getrepresentation, submitting to publishers, the publishing process, how to market your book, and general tips for writers. The event will be on Saturday 29th January 2011 at the Phoenix Artists Club, CharingCross Road, London from 12-4pm. Jackie Morris will be there signing books. During the evening each book bought will have a raffle ticket with it and at the end of the evening a ticket will be pulled out of a box or a hat and the winner will get an original drawing by Jackie Morris (see the drawing on her website - http://drawingalineintime.blogspot.com/ The drawing is an original sketch in pencil of the Ice Bear Mother, on board. To make this fair for people who live a long long way from Pembrokeshire this will also apply to all books bought from the mill's online shop - http://www.solvawoollenmill.co.uk/estore/index.php?main_page=index&cPath=38. The winner of the Booktrust Teenage Prize 2010 is Unhooking the Moon by Gregory Hughes.